DIRECTOR Anup Singh has a knack for creating aesthetically captivating films with slow-burning stories, that shock the viewer with surprises at the most unexpected moments. His latest ‘The Song Of Scorpions’ which screened at this year’s BFI London Film Festival (October 4-15) stays true to this form and is a fine follow up to ‘Qissa: The Tale Of A Lonely Ghost’. Both films star Irrfan Khan in the male lead and both have an ethereal, fairytale like visual quality with washed out colourisation: only this time Punjab is swapped for the vast, barren Thar desert of Rajasthan. Here we meet Aadam (Irrfan Khan) a camel peddler who is obsessed with Nooran a local scorpion singer played by Iranian actress Golshifteh Farahani. In these lands it is believed that when a person is bitten by a scorpion, they may die within 24 hours unless a scorpion singer sings to them, giving Nooran and her grandmother a mythical-like status in the community. The landscape is by far the star of the film thanks to endless views of desolate sand dunes. The scene is set for a perfect romance and yet Anup goes against the conventional. Instead of the melodic union we crave between these two lonely souls, he gives us a version of events with a far more harrowing outcome. The story has dark elements, which though begin as subtle, culminate in twists that sting as sharply as a scorpion bite itself. Irrfan’s character begins likeable but as the story progresses, his flaws unravel, which he plays with ease; though it’s never pleasant to watch such a likeable, familiar actor play negative roles. 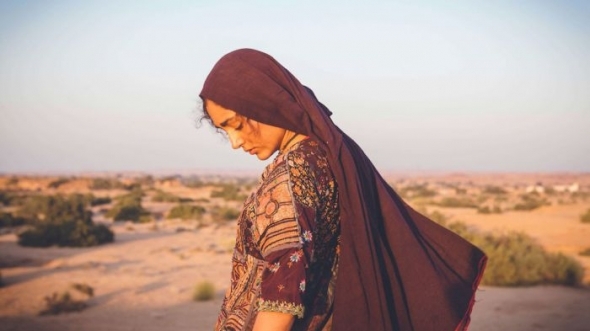 Golshifteh is one of the most versatile actresses in modern film. Her global looks lend themselves to playing international roles and her portrayal of an Indian desert girl is utterly believable, confirming she is an actress who can never be typecast. Though the film is slow and at times confusing, the overall package is a movie that is clever, original and refreshing and hopefully Anup Singh will continue to make films like this, that reflect his own inimitable style.